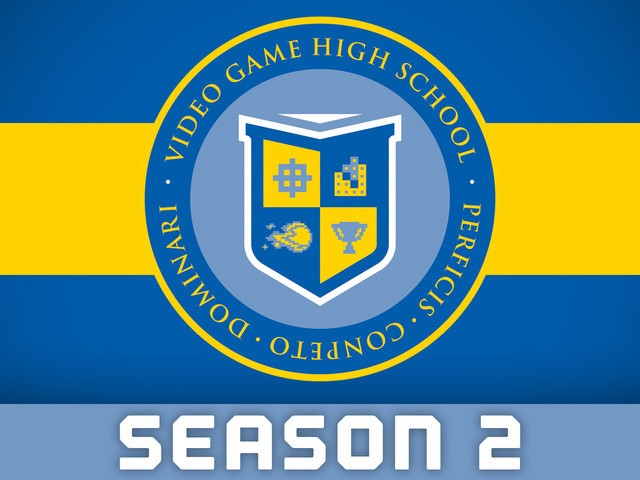 While I tend to focus the vast majority of this blog on feature films, I found myself bending slightly by reviewing the “movie” version of the web series Video Game High School. What was presented on Netflix as a feature film, was actually the entire first season of Rocket Jump Studios internet series. I was completely unaware that the series was in existence until stumbling across it on Netflix. While it took time for me to get into the cheesy, albeit enduring premise, I ended the evening in awe of the writing, acting and overall production. It has more cheese than nachos on the moon, but that’s part of what made the show. Imagine my surprise when the second season suddenly popped up on Netflix! 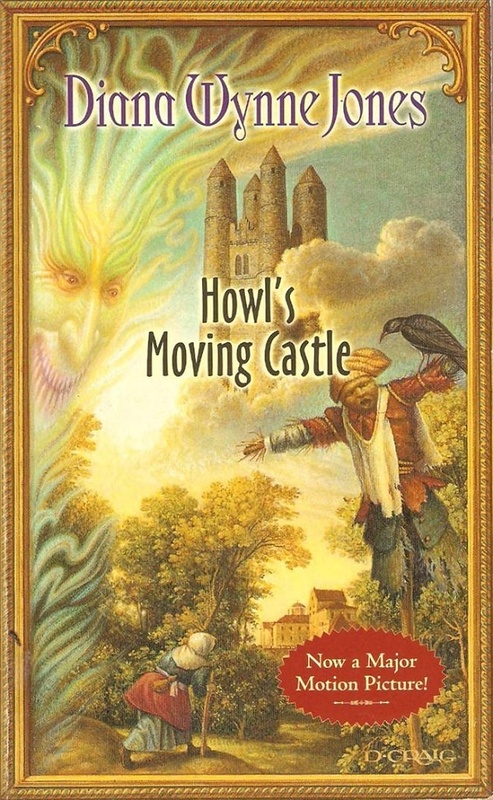 It took very little time for me to consume the, considerably longer, next chapter. The series picks up exactly where season one left us. “The Law” is shunned and trying to win back some cred, BrianD is still trying to prove himself and define his relationship with Jenny Matrix, who in turn has to deal with her mother becoming VGHS FPS coach. Ki and Ted also try to figure out both where they stand with each other and where they want their Video Gaming careers to head. The second season has a pretty great arch that encompasses each main character, while not compromising the individual storylines. The show boasts the same sharp writing that made season 1 one of my favorite comedy series, and it only gets better with this recent addition. With the season consisting of longer episodes, it felt much more like a standard sit-com, as far as time was concerned, but the freedom that the creators have over their environment offers a chance for jokes to run so rampant that it’s near impossible to catch them all. Brian Firenzi returns to his role as “The Law”. He was the main villain in season 1, and returns as a… well I guess just a jerk. He’s often times a villain, sometimes a hero and almost always a loser. He’s also absolutely hilarious. 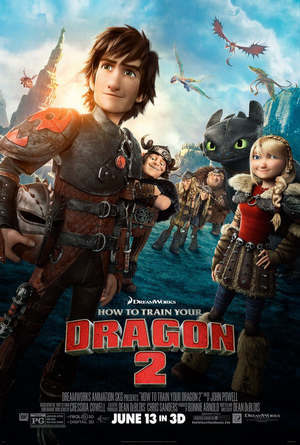 The main characters are funny, but a ton of credit is due to the supporting cast. The video game references and gags come at you non-stop, it’s a show geared towards nerds and game lovers, but has a level of chemistry that can be enjoyed by anyone. Like I said, it’s incredibly cheesy, but well worth your time. My friend, Paul Boyne recently posted on his blog a list of his “25 Funniest Movie Scenes”. If you haven’t popped on over to Infinite Crescendo, I highly recommend it, if for nothing more than his fantastic lists. Anyway, that particular post gave me an itch to put together one of those newfangled “supercuts” where you take scenes from a bunch of different movies and cram them into a youtube video. So I did. While I can’t give a definite list of my 25 funniest scenes, I simply present to you: 26 Movies That Made Me Laugh. Cosmic irony is a very important comedic element in regards to film. One can’t help but laugh, despite how painful it may be to a character when something good is expected and something bad is given. For the most part, comedy relies on reversals of expectations. For instance, what would think that your entire life would just be starting had you won the lottery. The possibilities are completely endless, you’ve got a fortune at your hands and no one to tell you how to spend it. So, it would be truly ironic if, after having played the lottery your whole life, you died from the shock of finally winning it. And so goes the story of Waking Ned Divine. In the small Irish town of Tully More there resides only 52 people. It’s a close knit community consisting of mostly older folk. Some of the residents play the lottery and dream of the riches it could bring them, among these are Jack O’Shea (Ian Bannen) and Michael O’Sullivan (David Kelly) two lifelong friends that make it their business to find who in the town was the sole winner of the last lottery. The news papers have announced that the winner comes from Tully More, but none of the residence fess up. It isn’t until Jack makes a house call to his last suspect that he realizes the winner, one Ned Devine, has passed away from the shock of victory. The rest of the movie the two friends come up attempt to claim the prize money, fooling the representative from the National Lottery Association, a feat that will take the cooperation of all of Tully More. Ned Devine is similar to the town of Tully More, in that it is quaint, kind and darkly humorous. Death is a strong theme in this film, obviously, but it’s displayed in a way, not lightly, but unflinching. We all die, there is no backing away from that fact, and the residents of Tully More make the best of a bad situation, which sometimes results in funny, albeit morbid situations. For instance, Jack and Michael attempt to change the expression on poor deceased Ned’s face, and in doing so knock out his dentures and are forced to comically put them back in. The characters are the backbone of the story. Within the small confines of the town are numerous stories, a few of which are explored in depth. Life, love and death fill the screen for a genuinely feel good movie with plenty of charm. The cast is superb, particularly the two old friends, they completely encompass the roles in a seamless transition from actor to character. 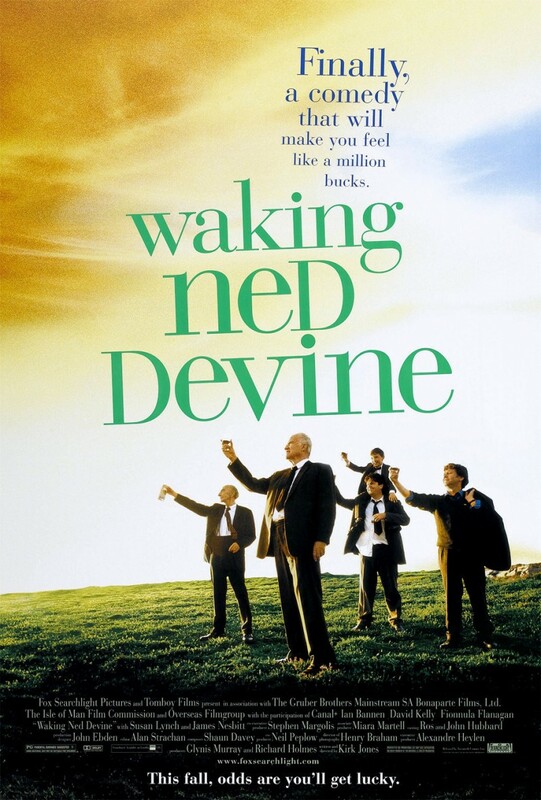 I had heard of Waking Ned Devine but had never taken the time to sit down and watch it. For whatever reason, I am often times reluctant to watch movies with small stories and small characters. The events are not world altering, they affect only a small group of people in Ireland. It’s not necessarily exciting or thrilling, but it is genuine and heart warming. I make the mistake of assuming something with a small story will have a small heart, whereas this is showed me quite the opposite. Observing an individuals interaction with their hobby is one of the most transparent windows into the type of person they are. It doesn’t particularly matter what type of hobby they have, should you find yourself in a position to witness the process of someone laboring at something they love to do, you’re going to get to know them a little bit better. This could apply to anything from building model airplanes to playing in a city softball league. The principles remain the same. There are countless documentaries that follow enthusiastic hobbyists in their pursuit of perfection towards odd practices, but one that was recently recommended to me was especially interesting, and equally fun. It was an opportunity to watch varying levels of Do-It-Yourselfers in action slaving away at making haunted mazes for trick-or-treaters each year. 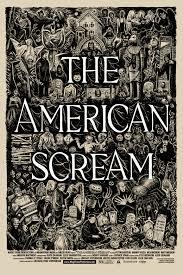 The American Scream follows three families as they prepare for Halloween. Each of these families has an annual tradition of setting up incredibly elaborate haunted mazes in their backyard and homes. The first family we see shows an obsessed father that works as a software engineer by day and spends the majority of his spare time designing props and scenes for the upcoming holiday. His family helps him and for the most part enjoys the hobby, but it’s not without it’s toll. Next we see a grown father son duo that are kind hearted, albeit slightly odd. Their approach to scaring is not nearly as professional as the first family, but they eagerly piece together props with instructions they’ve found on the internet. Finally we meet a man that, along with the help of his children, chooses quantity over quality for his maze, building props out of just about anything he can get his hands on. We observe these three families as the days count down to Halloween. We observe them as they interact with their passion, and it’s a blast. The film itself is fairly generic for a documentary. Switching between interviews and fly-on -the-wall style shots, we get to both observe the creation of the mazes in action and hear the families discuss the emotional implications that these mazes represent. But the real fun comes towards the end of the film when the three mazes open up for one night. The entire neighborhood comes out to try the three mazes, and the creators reap the fruits of their labor by basking in the screams of their community. The entire “haunting” culture is interesting. What is often viewed as weird on the surface can be linked to more “normal” human traits. The fascination can certainly come off as macabre, but it’s not without it’s charm, and that charm lies solely in the individuals that choose to put their strength and effort into a passion project like this. One thing that was brought up was the communal aspect of Halloween. Thanksgiving and Christmas are more family holidays, whereas Halloween is about the community. Behind the makeup and the blood lies a surprisingly warm tale of human kindness. The Muppet empire was created by a group of incredibly ambitious dreamers that strove to perfect the art of puppeteering, making it something far more than an easy, cheap go-to children’s entertainment option. Jim Henson, known for being an avid perfectionist, was the mastermind behind the ordeal, and it’s thanks to him that some of my all time favorite movies have been made. The Muppets themselves have had a fantastic career in the film industry over the past few decades, most recently with their comeback hit The Muppets. The Muppets was a fun and lovingly crafted piece of work that pays tribute to the origins of the group, but it lacked two major components that can never truly be replaced; Frank Oz and Jim Henson. The Muppet Movie was the beginning of the road for the motley crew of fabric puppets. Like quite a few movies I’ve watched recently, the overall tone is very self-aware. We quickly realize that we, the audience, are watching the screening of a film that tells the story of how the Muppets ended up in Hollywood (approximately). We’re introduced to Kermit as he sings and plays his banjo in the swamp. He’s accidentally discovered by a lost Hollywood agent who convinces him to audition for a movie role. Kermit then embarks on a cross-country adventure that gives a back story to the majority of the cast of the much beloved Muppet Show. Although filled to the brim with musical numbers and cameos, the movie really shined in it’s masterful use of the puppets that run the show. As I mentioned before, Jim Henson was a perfectionist. He had a vision and he wanted to make sure that his vision was accomplished exactly as his mind saw it. So, when we watch the opening musical number that shows Kermit sitting on a log in a swamp playing his banjo and singing we think very little of what it took to accomplish a feat like that at the time. In truth, the scene took five days to film. Jim Henson was submerged under the water in a small metal container with an air hose and a monitor so he could watch his actions with the puppet. While watching it today may not have the same aw-inspiring effect he originally intended, this was the first time a hand puppet had performed on screen with its entire body showing. The intention of the film, aside from making people smile with fun music bits, corny puns and tons of guest appearances, was to wow the audience with what could be done with puppets. Little things were huge successes, particularly the scene where Kermit rides his bike down the street. It’s not a close up shot, it’s not cutting off his legs with the shot, it’s showing him riding down the street in full view. The ingenuity and creativity of Jim Henson is seen in full force in their first ever feature film. Some might argue with my opinion that the pacing of the film is a bit slow thanks mostly to some less that incredible songs. 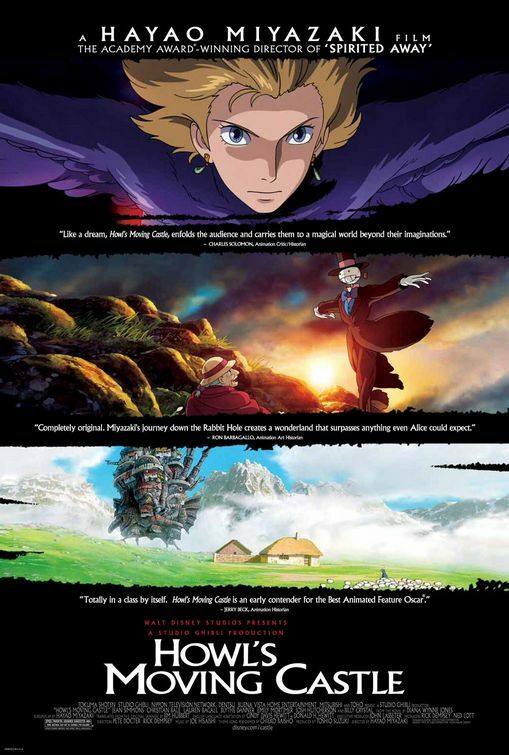 Visually and technically it is a masterpiece, and most of the music in the movie is fun and engaging in the way it draws the audience closer to the story and the characters. However, some of the songs seemed a little out of place an unnecessary, proving to detract from the overall pace of the movie. It’s a very small gripe in comparison to the whole. 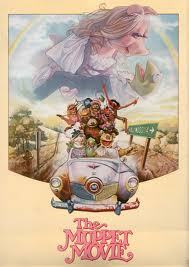 The Muppet Movie has, and always will be able to impress me. It’s the original, the beginning to one of the most beloved media empires in our history, an empire headed up by a felt frog.